The OHV Color Tour (formerly the ATV Historic Color Tour) enters its eighteenth year. This tour is for side by sides and all types of Off Highway Vehicles. 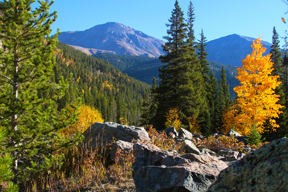 Experience the rugged terrain, fall colors and historical sites in the heart of fourteener country. 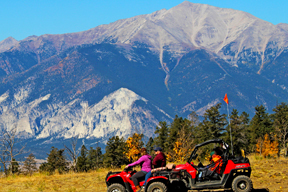 Riders will experience four days of self-guided tours through the awe-inspiring backcountry of the Collegiate Peaks range with 12 fourteen thousand foot mountains! The greatest concentration of 14,000 ft. peaks on the continent. 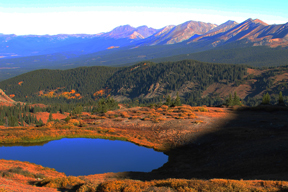 Buena Vista is minutes away from the San Isabel National Forest with its 1,109,782 acres of true splendor and over 700 miles of trails to explore. Our town is also the gateway to the 148-mile long Arkansas Headwaters Recreation Area with its Gold Medal fishing. To make things even more enticing we have two Hot Springs to relax in after a thrilling day’s ride. Participants will be able to explore old mining camps and ghost towns via high mountain passes where gold and silver ore were carried by mule wagons to the railroads. Please note access to daily rides requires trailering your off-highway vehicle to trail heads. 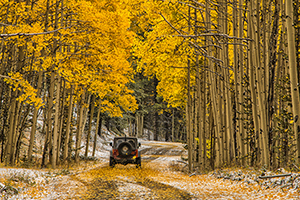 The OHV Color Tour is timed to coincide with the fall colors, the aspens are all aglow with gold and red tones. Each morning riders choose their route, there are many to select from (different each day). There are no more than 50 riders allowed on the same trail. The tour is run differently than most as there are no guides, each rider chooses their self-guided ride and goes at their own pace. 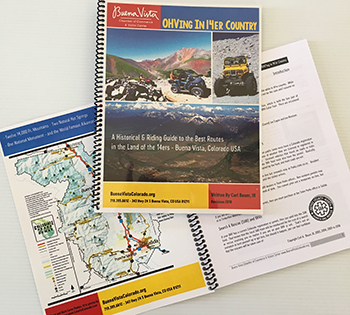 With your registration it includes a book entitled, OHVing in 14er County to assist you with maps and details of each ride. Each trail has volunteer outriders to answer questions and make sure everyone gets back each night! The OHV Color Tour is hosted by the Buena Vista Welcome Center & Chamber of Commerce. The Tour is operated with permits from the US Forest Service and the Bureau of Land Management. It is setup as a self-guided event for Off-Highway vehicles. Most participants ride ATV’s, or side-by-side UTV’s, and off road vehicles. If someone in your group wants to ride an OHV motorcycle, that is allowed, if they ride with the group. Scroll down this page for all the details. 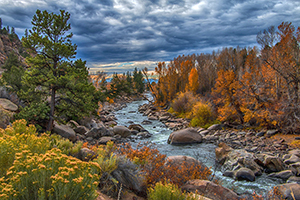 South Central Colorado weather in late September is usually cool in the mornings (low to mid 40’s), then warming up in the afternoons (60’s – 70’s). Buena Vista is a mountain town at 8,000 feet above sea level. The humidity is usually low, the sun shines a lot and anytime you’re in the sun, it feels warm. Temperatures can dip greatly if a storm approaches. Most of the riding is between 8,500 – 10,500 feet above sea level with a little at 13,000+. The best plan is to dress in layers and bring rain gear in case of changing conditions. The Forest Service and BLM now require for the permits for this event that all participants wear proper personal protective equipment. This includes but is not limited to helmets, gloves, boots, goggles and protective clothing. Carry an emergency repair kit, food, water, warm clothing, an area map and guide, a flashlight and sunscreen. For most of the rides you’ll need to bring your own lunch and drinks for an on-the-trail snack. Remember to drink plenty of water. The event kicks off Tuesday evening at the “packet pick-up”. Detailed information, tickets you will need, T-shirts, etc. are all in your packet and one-on-one briefings are held to answer questions. Plus, it is a great time to meet your fellow riders. Each morning of the Tour, breakfast will be served at the location TBD. At breakfast participants sign up for their choice of the available rides. The ride lists change each day. 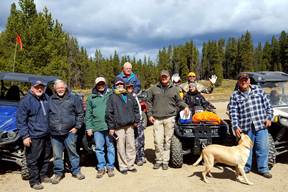 This is a terrific way to get to know the local outriders and learn more about the community and vast area OHV rides. On Friday, all tour participants are invited to the Friday evening get-together and dinner featuring give-away drawings and (weather permitting) ATV Rodeo & more. Because of the high altitude, some OHV’s with engines that use carburetors may experience performance difficulties unless they are properly jetted. Fuel injected engines in good working order, normally do not have any issues. Colorado law requires ALL non-licensed vehicles using OHV trails to display a current Colorado OHV permit. The permit (sticker) costs $25.25. Permit information from the State can be found on their website. Permits are available for purchase at Timberline Motorsports 29770 US-24, Buena Vista. All of the trails are open to Off-Highway Vehicles. All of the trails for the event can be ridden on an APPROPRIATE OHV motorcycle. “Appropriate” means, Enduro/Motorcross type bikes and some Dual Sport bikes. Riding on the trails is NOT RECOMMENDED for any motorcycle bigger or heavier than a Suzuki DRZ 400. It is not required that an OHV motorcycle be street legal. 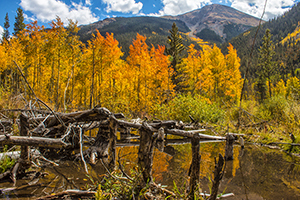 “OHV’ing in 14’er Country” is the official guide book of the OHV Color Tour held each fall. This book comes free with your registration. Although this book is geared toward OHV recreation, it can certainly be used as a guide for other forms of travel. Most routes require at least a high clearance vehicle such as an ATV, SUV, OHV or motorcycle, or 4 wheel drive vehicles. 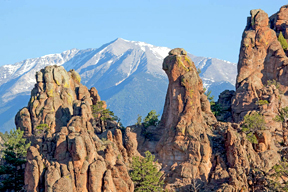 Chaffee County offers some of the most varied riding terrain you will find anywhere. 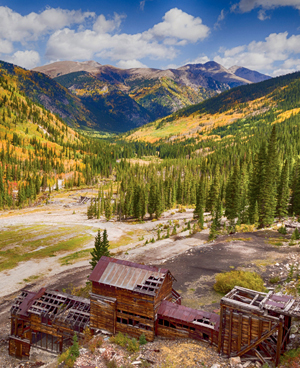 Throw in some history about the mining, ghost towns and railroad then add incredible scenery and you’ve got . . . 14’er Country! This 52-page book contains 14 spectacular routes, with many off-shoot routes, including maps along with a brief history of the area within the route. It also has, things to see and watch out for, where to fuel up, trail etiquette, environmental concerns, and contacts of supporting non-profit trail management groups. Click here to order this book. Get ready for tons of fun with rides Wednesday – Saturday. Breakfast on ride days is included. The breakfasts are served by non-profit organizations, so not only do you get a delicious meal but you are supporting our community and these terrific organizations. Attending the breakfast is a good way to meet participants and outriders, along with getting the route information for the day. We appreciate you letting us know what breakfasts you plan on attending so that our awesome breakfast sponsors can better plan. Each morning you’ll choose your route, there are several to select from and picking a favorite might prove impossible. These are a couple of our top picks. Hancock/Tincup Loop – Starts at the ghost town of St. Elmo near Buena Vista then heads up Hancock Pass over the Continental Divide. Just on the back side of The Divide is the side trip to the Alpine Tunnel, the first ever bore through the Continental Divide. It’s a beautiful trip on the old railroad bed to where some of the buildings are still standing and the remains of the Boarding House are in a heap. Interpretive signs and photographs are on display in one of the buildings, but the tunnel is long since collapsed. Mt. Antero/Brown’s Lake – This route will take you almost to the summit of one of the 14’ers (ride to 13,700’). It takes a few ponies to get to 13,700’ and 4WD will help get past a couple of the more interesting places. Click here to view more ride details. Q. Are special OHV permits required? A. All unlicensed vehicles using OHV trails in Colorado are required to display a Colorado OHV Permit, (sticker). 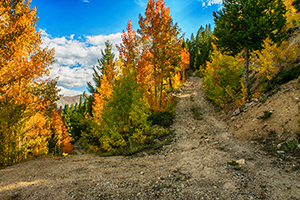 Even if you have an OHV Permit from your home state, you will still need a Colorado OHV permit. 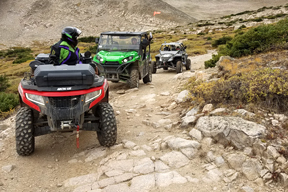 OHV Vehicles with license plates are encouraged to get the permits, the money is used for trail maintenance and to support search & rescue operations. The stickers cost $25.25 and are available Tuesday night and Wednesday morning of the Tour. If you are coming from out-of-state, the permit can also be purchased online by [clicking here]. Original registration (purchase), of in-state permits is not possible online, only renewals. Q. Do we have to trailer? A. Yes. There are many close by places to ride but you do have to trail from the campgrounds (trust us it’s worth it). Routes range from alpine forest, chaparral desert, ghost towns, passes that cross over the Continental Divide, trails at or near, the summit of 13,000+ foot Mountains, etc. None of these routes are very far from Buena Vista, but to get to the trail heads, you will have to trailer. Q. Can we ride double on a ‘single’ machine? A. It is permitted, but please use good judgement. Q. What elevations will we be riding? A. Buena Vista is in a high desert valley at 8,000 feet above sea level. The routes will vary from 8,000 to near 14,000 feet. A. Yes. Special event permits had to be pulled with the National Forest Service and Bureau of Land Management. These permits stipulate that helmets are required for those participants of this event. The type of helmet that is required is a full face or a half face and then eye protection is required. Q. Can children ride their own machine? A. That’s hard to answer. There is no law that sets the age limit, so the responsibility falls back to whoever is responsible for the child. The child’s experience is also a factor. You MUST USE GOOD JUDGEMENT and the child must be kept under close supervision of an adult. Q. Can I get the guidebook early so I can study the routes? A. Yes. Call the Buena Vista Welcome Center & Chamber of Commerce (719) 395-6612 or order on this site. ♦ No refunds after Friday – September 13, 2019. ♦ All refunds are made to the credit card used for registration. Registration fees and Guide Books that were purchased through this website and not shipped. $90 refund for each registration. No Refunds for Breakfast or Dinner that are not attended during the tour.